Apple uses such terms as "Fall transition" to represent changes to their product lines. Lower expected gross margins could point to new products with lower prices. The obvious speculation would point to the much rumored smaller/cheaper 7.85" iPad. Whatever the "fall transition" is, Apple expects it to take place before the end of September in order for it to impact the next quarter. Try very hard to keep our product roadmap secret and confidential. We go to extremes to do that. That, however, doesn't stop people from speculating or wondering and they'll never do that. The great thing about this country is that people can say what they think and so-forth. I'm not going to spend any energy trying to change that. I'm glad that people want the next thing. I'm super happy about it. There are obviously quite a few that want what we're doing now as well. I'm not going to put any energy into trying to get people to stop speculating. I don't think it would amount to anything. 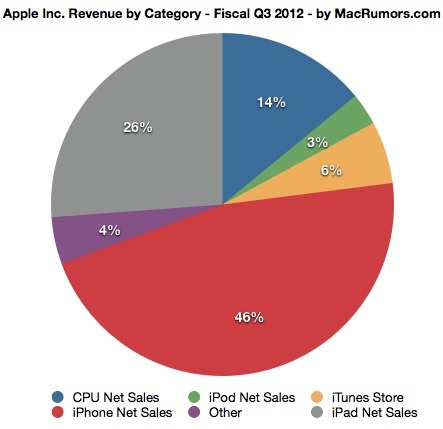 So disappointing that Apple failed so greatly on their earnings last quarter. Apple, the worlds most valued company, grew 23% over one year, beating their own quarterly predication. That is only disappointing in a VERY specialized sense of the word. "The great thing about this country is that people can say what they think and so-forth." Is it just me or do Americans think they invented free speech, you can say what you think in the vast majority of countries! Apple is a Cyclical company with relatively predictable product pipelines. Apple really needs to be judged in a YoY capacity. They are doing just fine. If we see similar numbers for the next two quarters (Depends on exact iPhone and iMac refresh periods) then we have a real issue. At the moment it's no different than any other quarter. Apple releases numbers (beating their own guidance by some amount) and then the stock goes down to recover over the next few weeks. While it's true they didn't beat their own numbers by the same ratio as they have in other times, that could be any number of legitimate reasons, the simplest of which is that Tim Cook may be trying to give more accurate guidance. At the end of the day, the official guidance was well exceeded, they have strong YoY growth and as a company their image is only improving. Cracking success I would say. But it could be soooo much better!!! Eg Web browser, more tv channels! And maybe Apps??? I really like my Apple TV. Hopefully Apple continues to progress the platform. Apple uses such terms as "Fall transition" to represent changes to their product lines.